It took me some time, but I was finally able to find a photo of our newest international signee, Takumi Numata. Check out the above fantasy Baseball card I made of him. As you can see, I wasn't able to find a great pic, but I guess it'll have to do. 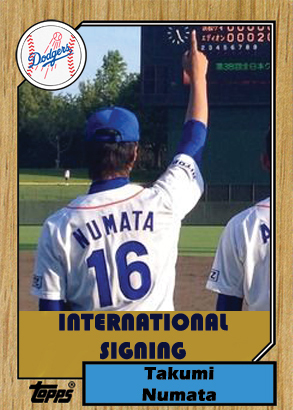 Numata is a 19-year old right-handed pitcher from Nagoya, Aichi, Japan. He stands 6' 1" and weighs 188 lbs. I'm unsure exactly what he brings to the table (I don't think anyone besides the scouts know what he can do), so we'll have to wait and see. He is expected to report to Camelback Ranch to work out with their instructional league team. It's just nice to see the Dodgers finally reaching throughout the world to sign talent after such a long layoff. BTW, I think I found Numata's twitter account, but I'll wait to disclose that until I receive confirmation. After graduating from high school, he attended Nagoya Sangyo University and dropped out after his first year. He started playing for the Industrial League club team Edion Aichi Kogyo Daigaku OB Blitz this year. UPDATE II: Rodd Gasmer at Dodgers Nation makes note that Japanese Amateur Baseball Association might scuttle this signing. Check out what he says here. 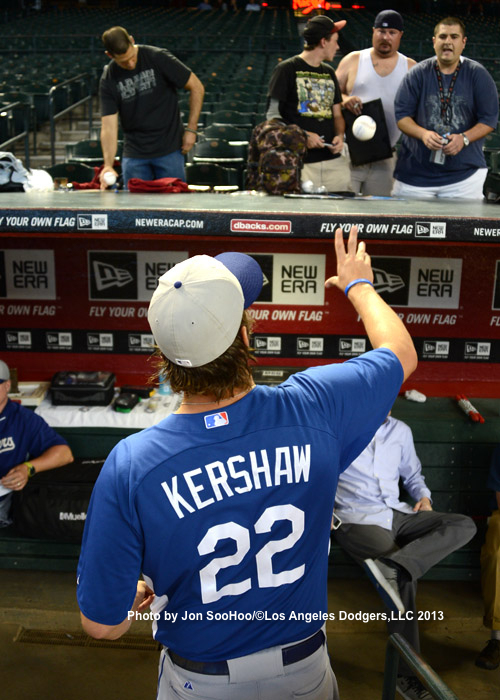 Clayton Kershaw signs for some fans in Arizona in the pic above, via Jon SooHoo/LA Dodgers 2013. See more pics from him from yesterday, here. Numata, 19, graduated from Ohgaki Nihon University High School in 2012 and played for the Edion AIT OB Blits of the Japanese Industrial League from April-September 2013. The 6-foot-1, 188-pounder from Nagoya, Aichi, Japan was signed by Dodger scouts Isao O'Jimi and Pat Kelly. Numata is expected to report to Camelback Ranch - Glendale, where he will work out with the Dodgers' Instructional League team. Oh, dung! This kind of move does not bode well. Maybe Alexander Guerrero isn't headed to the Dodgers. The Roberto Clemente Award presented by Chevrolet pays tribute to Clemente's achievements and character by recognizing current players who truly understand the value of helping others. The 15-time MLB All-Star and Hall of Famer who died in a plane crash on New Year's Eve 1972 while attempting to deliver supplies to earthquake victims in Nicaragua. 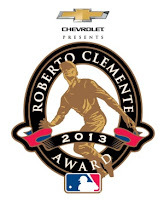 "I'm truly honored to be nominated for this award that pays tribute to Roberto Clemente, one of the greatest in the game who also had an extraordinary impact off the field with his philanthropic efforts," said Gonzalez. "Everyone should strive to be the type of man Clemente was and I am humbled that I am the Dodgers' nominee for this prestigious award. It is very important to me and my wife to give back to the community and I look forward to doing so much more." "Diamondbacks 2, Dodgers 1: Hyun-jin Ryu tosses gem, loses," via Eric Stephen at True Blue LA. "Billingsley thriving in recovery from Tommy John surgery," via Ken Gurnick at MLB.com. "My arm probably hasn't felt this good since high school," said Billingsley. "When you're a teenager you pick up a ball and just start throwing, not worrying about having to loosen up. That's how it feels now for the first time since I was in my teens. I'm really happy with how it feels and the way it's going. They have to hold me back, it feels so good." Chris Levy at Sports Collectors Daily informs us that there will be a another card show in Culver City on Saturday, October 5th. Tony Jackson at Dodger Scribe lays down the smack down on Don Mattingley's managing of the 9th inning in last nights game. I don't entirely hate the sacrifice bunt, but do not believe it should be the "go-to" play at all times. I do think there's a time and place for it, and last night was not the time. He should have let Uribe swing away. Via Steve Adams at MLB Trade Rumors, "Mark Kotsay To Retire At Season's End". Although he has no Dodger ties, I wanted to mention this. He was a star outfielder while I was in college at Cal State Fullerton, my Alma Mater, and lead the Titans to a College World Series Championship during my senior year. Congrats on a great career!